Lovely one bedroom stone villa sleeps 2 till 3 people. Escape from the ordinary and enter into the tranquility of peaceful and romantic sunsets, cool sea breezes in a romantic garden. The position of the villa offers you total relaxing in a beautiful private garden, private pool,air-condition, sea view, and is ideal because within 3 minutes car drive you’re in Hersonissos town with great night life good restaurants, grocery, great shopping, medical center and nice beaches. The traditional Cretan villages Old Hersonissos, Piskopiano and Koutouloufari are 2 minutes drive away. Here you can taste Cretan traditional food and hospitality. The house and its surroundings create a big deal of outdoor activities including, horse riding 500 meter, golf with 18 holes 3km, walking and mountain biking, boat trips. The beaches and big Water parks with slides nearby offers water sports of all kind, even bungee jumping. We live here in Crete, and we have two lovely daughters. We work full time in the tourist branch for more than 25 years. After so many years in tourism we know exactly why people come to Crete. People want to escape from all the stress and everyday living. Relaxation is what people looking for. We have tried to create with a lot of love and imagination this little “paradise” for you and for ourselves. We chose this particular area for its peaceful location and beautiful sunsets. Within a few minutes drive you can find everything you need in the villages nearby. There’s easy access to the property and the beach is only 1 km away. To the airport it is only 15 minutes drive with the car. There’s a nice toilet shower downstairs with a stylish sink. On the ground floor of the villa is the kitchen- living room with one sofa bed. The kitchen is equipped with fridge freezer, electric oven and ceramic plateau, microwave oven, filter coffee maker, toaster, radio c.d player plus many other utensils. We have a welcomes pack for all our guests. The Crete Golf Club is a championship course, the only 18-hole golf course on the island of Crete and one of the most impressive courses of the Mediterranean, which holds a unique challenge and a pleasant experience for both golf players and visitors all year round. It is easily accessible and from the villa it’s only 3 kilometer away. The course has been built to international PGA standards by architect Bob Hunt, a member of the English PGA. Each hole has been constructed separately and in harmony with the surrounding landscape, providing panoramic views of both the mountains of Crete and the Aegean Sea. The Crete Golf Club has a desert-style layout, it is meticulously maintained and at the same time it provides an ideal venue for international tournaments. It has hosted the EGA Mens’ Challenge Trophy with great success in July 2008, while for 3 consecutive years it also hosted the Aegean Airlines Pro-Am. It's not fun writing a bad review, especially when the owner is nice like Poppy, but hopefully this can help others avoid making the mistake we did when we booked our honeymoon here. We were really excited about staying at Villa Valentine based on the pictures and reviews on HomeAway. We were anticipating a lovely peaceful, relaxing and luxurious stay in the Cretan countryside. Unfortunately, what you can't tell from pictures is that the villa is noisy, uncomfortable and in unpleasant surroundings. The biggest problem was the noise, and especially the barking of the dogs the next-door neighbours keep chained up in their yard. It was loud, menacing and persistent, and was particularly a problem in the evenings and early mornings. The neighbours on the other side have a contraption in their yard that whirrs loudly throughout the day, and planes fly overhead throughout the day and night, which added to the problem. The other really big problem was the bed - the mattress was probably the worst either my wife or I have ever laid on, with springs painfully digging into you. To get a good night's sleep, we brought the covers from the sunloungers inside and slept on them. The shower is also an issue: small and cramped, it rarely had enough hot water for two showers and sometimes had none at all. The final issue we had was the location. The immediate vicinity is more wasteland than countryside and the region of Crete just isn't very nice. Agios Nikolaos was pleasant but that's a 45-minute drive away. Because we weren't enjoying ourselves as much as we'd hoped, we travelled to Chania on the West of Crete to stay there for a couple of days and that was lovely, and we'd strongly recommend holidaying there. There were some positives to the villa. The garden and pool really are as pretty and well-maintained as they look in the photos and are very private - in the moments during the day when there is no noise, it's a nice place to be. The kitchen is adequately equipped, and Poppy had provided some groceries on our arrival, which was a nice touch. Overall, though, we regret staying at Villa Valentine and wish we'd stayed somewhere in or near Chania instead. First, I want to thank you for your feedback and taking the time to explain the concerns you have experienced. I am so sorry to hear that your stay did not meet your expectations and regret any distress you experienced as a result of this. I work very hard to deliver an exceptional guest experience and I am sorry to hear about this afterwards as you did not address these issues during your 8 days stay. I would like to take this chance to comment on your points. Indeed you contacted me regarding the barking dog and I immediately contacted the neighbor. He informed me that at this was an exceptionally case since that day there was a thunderstorm which upset the dog, I am really sorry about this. It is a pity you never contacted me during your stay regarding the mattress. I never had any previous comments regarding the mattress. If you would have told me during your stay that the mattress was not comfortable, I would have exchanged it straight away. The same goes for the hot water, there is always hot water (solar and electric) and never had any previous complaints about this issue. Crete is on nr. 4 of top holiday destinations in Europe on Tripadvisor 2018. 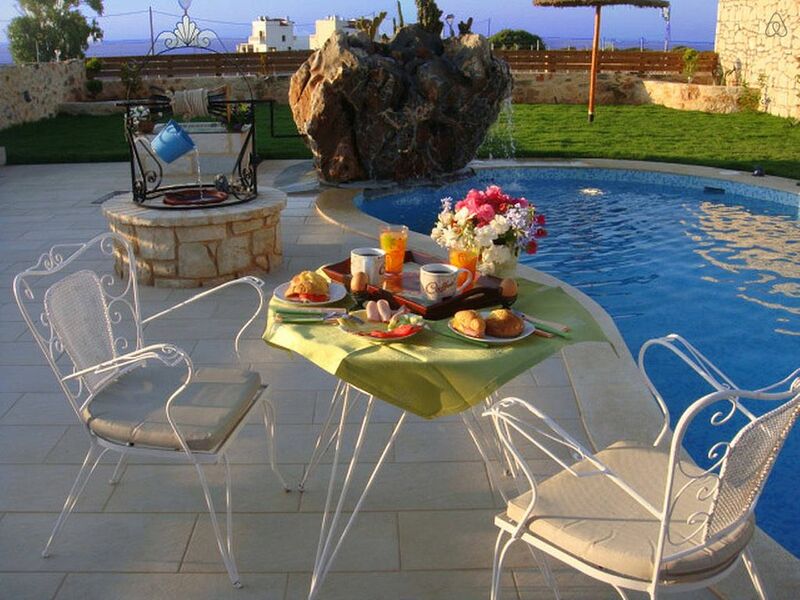 Villa Valentine is located in the center of Crete near the sea. This is an ideal location and a perfect base for our guests to discover the rest of the island. We do get a lot of positive comments regarding the privacy, the nice surroundings and traditional villages nearby. Finally, I would like to thank you for the positive comments regard the garden and the pool area. I have tried to put a lot of love and effort to achieve this and to make a nice summer/holiday home for my guests. Your feedback is highly appreciated and will help me to improve and to exceed the expectations of my guests. met with poopy who was very friendly and helpful went to Villa which is small but lovely with a wonderful outside area and pool where you will spend all your time,had a lovely relaxing break,shops and buzz are minites away if required but we didn't bother,would highly recommended this villa. We came to Villa Valentine on honeymoon and it was perfect for us - a small but beautifully-kept villa out of the busy touristy areas, plenty of space to relax outside in the shade, a private swimming pool and within walking distance of a bus stop. Poppy our host was very welcoming (we were thrilled to find fresh fruit and bread waiting for us when we arrived late at night with no idea where to find food) and really helpful, going out of her way to help us make the most of our stay. We enjoyed a trip to the local beach, and to a lovely restaurant in the old Hersonissos village. We would highly recommend to others. We stayed here for a week. The villa is small but the large and well equipped outside area is magnificent. The pool is lovely and the garden and shaded area are everything you need for complete relaxation. We drove to nearby villages for dinner where the food was lovely. If you are looking to get away from it all, it's worth a look. We visited for a week in May and loved the villa. It is a lovely, compact little home with a fantastic outdoor space. The pool was wonderful relief from the hot weather. We loved using the BBQ and even had an attempt at using the pizza oven after finding some pizza dough flour in one of the nearby supermarkets. Plenty of pots, pans and utensils if you want to cook but the villa isn't far from Hersonissos where you can eat in tavernas. I'd recommend getting a hire car as it's too far to walk to the nearby town, which is great if you want to escape the touristy areas but still be close enough to travel to them for day trips. The villa was a great base for us to explore the island. Poppy was really welcoming and helpful. Hopefully we'll be back one day soon!! Excellent location, remote and quiet, but still close to Hersonissos and Heraklion, with lots of restaurants, beaches, museums, attractions near by to visit (need a vehicle, we've rented a car from airport). Private pool, beautiful garden with sea view. Perfect for couples. Thank you for the positive feedback on villa Valentine. It was nice to read that you enjoyed every moment of your stay. It was also very pleasing to read you enjoyed the restaurants, beaches and the other atractions nearby. There's much more to discover on Crete. Hope to welcome you back again for a relaxing holiday in the near future. The distance to the nearest sandy beach is 1 kilometer. There're many sandy beaches and you can do here all kinds of water sport or boat trips. Nice big water parks with slides are in a distance of 3 km. Heraklion harbour and airport are only 25km from the property away. With a car or taxi it's very easy to reach. Within 3 minutes drive you have everything you need in the villages nearby. good restaurants in front of the sea, grocery, great shopping, banks, para-sailing, deep sea fishing, scuba diving, horse riding 500 m, golf 18 holes courses , resort hotels, water parks, medical center, sandy beaches and great night life. Special welcomes pack for all our guests!